Today I have a gift for you – my new book, 21 Insights for 21st Century Creatives. You can pick it up for free from Amazon or other bookstores. It’s a compilation of the most powerful insights that have emerged from my coaching conversations with creative professionals over the past two decades, and also from my own practice as a poet and author. In tackling this challenge, I’ve come up with answers you won’t find in books of traditional career advice. And I didn’t pluck them out of thin air – they emerged from 21 years of conversations with hundreds of creative professionals like you, who were wrestling with these issues for real. I’ve deliberately kept the book short, with a brief chapter for each insight, so that you can keep it handy on your phone and consult it in the quiet moments of your day, or on those days when you need to dig deep for motivation. I published an earlier version of the 21 insights on my blog last December. Once I’d done that, I thought it would be nice to turn it into a booklet for my coaching clients, as a welcome present and required reading when they started working with me. So I started working on that, and found myself revising and expanding the text… until it grew into the length of a short book. At which point, I thought ‘Why don’t I publish this and give it to all my readers and listeners?’ It seemed like the obvious thing to do, so here it is for you. As usual, the book cover has been designed by Irene Hoffman – and as usual, she has outdone herself and delighted me with her visual magic. Thank you Irene! I’m giving you this book as a gift because I want you to benefit from the insights in your own career. I also want to reach as many creative people like you as possible, and make the biggest difference I can as an author. 1. Write a short review of the book on Amazon or whichever bookstore you get your copy from. It doesn’t need to be a long review – it could be as simple as saying which of the 21 insights you personally found most helpful. Thank you, as always, for reading. 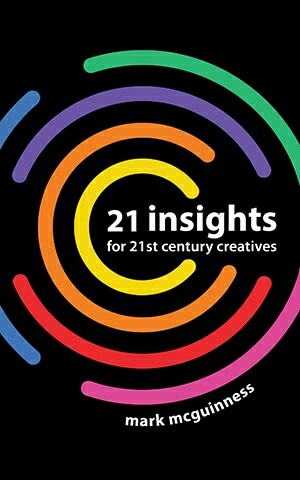 You can pick up your free copy of 21 Insights for 21st Century Creatives on Amazon or elsewhere. I hope it helps you create more and suffer less, whatever your creative path and wherever it leads you. Mark, I just read your chapter about an effective daily routine in the book, “Manage your Day-to-Day.” I’ve already gleaned a lot of insight from it. So, thanks for providing this book for free! (Especially as I am a low-income pastor, and just now building on my creative strengths!) I look forward to learning more from that and other resources you’ve written.